Really it was a mistake. 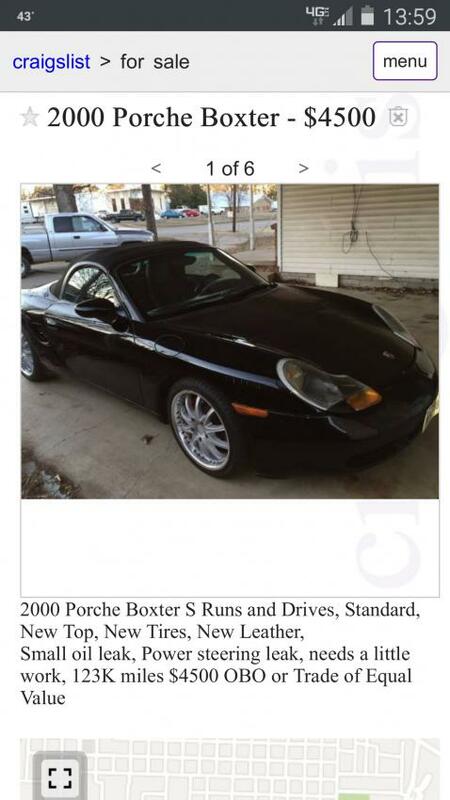 Last February I saw the listing for a 2000 Boxster S needing some TLC. I figured worst case, I could use it as a parts car. Over the phone I immediately talked the seller down $1000. That should have been a sign. This car is troubled and you should run, not walk, away. Instead, I was encouraged. I was getting a driveable 2000 S for the cost of a roller. From the description, I imagined that it just needed an AOS and water pump, both of which I had on hand. Later, I found that those were the least of its problems. The guy I was buying it from had taken it in trade for a Chevy truck and the only thing he knew about the Boxster was that he didn't want it. 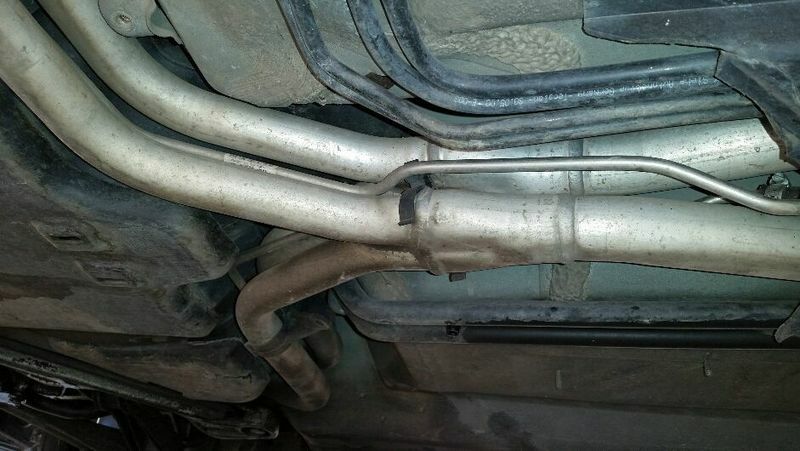 It was blowing smoke out the exhaust and it would start to overheat if you ran it too long. I didn't even really do a 'self-PPI'. I just drove it around the block and gave it a quick look. Since the seller thought it was a four cylinder and didn't even know for sure where the engine was, I felt like an expert. Paid the cash and took him up on his offer to deliver it 50 miles to my home. Back at my house over the next day, I figured out just how badly I had done. Instead of the 3.2L engine I expected, it had a 1997 2.5L engine. The water pump had no impeller blades left. The center radiator was installed, but not connected. A couple coils were cracked. Climate control did not function. The top worked, but only one side had a functioning transmission – the other side was disconnected. The body had a lot more repairs than I had originally noticed. The steering rack was leaking. The undercarriage was rough, missing most of the plastic panels and just about every piece of tubing was dented and poorly secured. Much of the interior had glued-on trim pieces that were broken or peeling off. No airbags and a poor job of covering up their absence. It could sort-of be driven, but really was not even of much use as a parts car. I messed with it for a week or two, then put a cover over it and left it alone. I had plenty of other cars and projects. Occasionally I'd drive it a few miles to the store, or move it around the driveway. Eventually it became a place to throw car covers in when I took other cars out for a drive. A place for batteries to die. Now more than six months after I got it, I'm ready to take another look and see if I can give it a purpose. Next year I intend to spend more time at the track and running autocross. I have heard it said that if you can't afford to drive a car off a cliff, don't take it to the track. I like all my other cars and would hate to have one get damaged. This one, not so much. Meet my future track car. I have no intentions of building it into a real race car, but my local track has regular “High Speed Touring” (DE) weekends and a racing club that I can aim for eventually if I install proper safety gear. The 2.5 still feels as strong as my '99s, so I'm going to plan to run with that while I get the rest of the car in shape. Still dreaming of getting a 4.2L Audi V8 in there, but that's either going to take a lot of money (that I don't want to spend on this car), or skill that I have not yet developed. 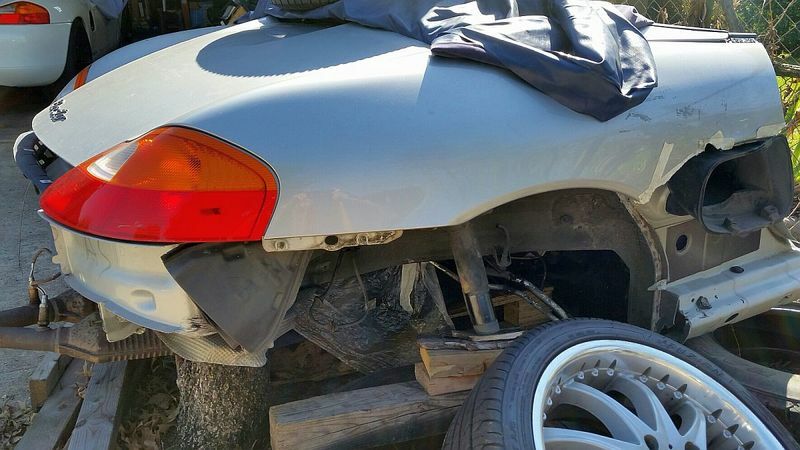 For now its going to be more of a rehab project on a car with nothing to lose. Great story confirming the need for a professional PPI. How does the blades get broken off the water pump? Could it be from trying to start it while water/coolant is frozen? Or is this a crazy thought? And did it come with the hardtop? If it come with the hardtop, you can sell it and break even any time you want, you did ok. He paid more than $1000 for it - he only talked the seller down $1000. I'm guessing he paid somewhere around $3500?? Said it was the price of a roller. I understand the confusion. Let me clear it up. It was not an awesome $1000 deal. The car was listed on Craigslist for $4,500 and when I responded to the ad, I told the seller that the absolute most that I'd be interested paying for it was $3,500. He said that sounded good to him. I think that the seller was fair and reasonably honest. He just didn't know anything about these cars. At that point having rebuilt two salvage cars, I should have known better. If I had done a proper inspection I probably would have offered $2,000 - $2,500 max. On this one, I was my own sucker. I actually did quite a bit of work on it immediately after I bought it. It is a roadworthy car now (for Oklahoma), but not a good specimen to bring to Cars and Coffee. ...blades get broken off the water pump? I can only guess about the water pump. 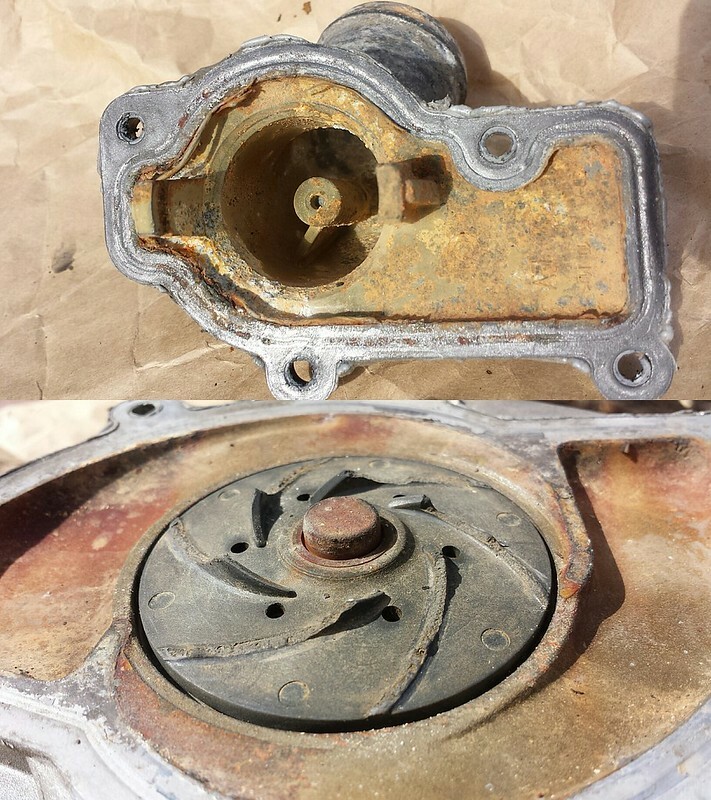 I think that it was an original 1997 pump and judging by the corrosion, it was not running a proper coolant. Brittle with age, when one started to give out, it probably cascaded. I bet JFP in PA can give a better answer. ... did it come with the hardtop? No, I have two '99s that came with hardtops. I installed the extra spin-locks (from Woody), so I can pass them around between cars. The headlights that came with it were trash. I replaced them along with one of the mounting trays. It came with the original S style front bumper. I gave that to Redtele58 for his spec car. I plan to cut the one that is currently on it when I connect the center radiator back up. The wheels that came with it were cheap, heavy, knock-offs with curb rash and bad paint. Did you verify that it still has the other S parts (brakes, transmission, cooling tubes)? Yes to all three. I had seen enough fake S models on Craigslist, that before I even went to see it I verified that it had a correct VIN number. I suppose that I am lucky that the transmission and brakes didn't get swapped along with the engine. One thing I didn't notice until about a week ago is that the rear shocks don't match and the right side sits a little higher than the left. Rear shocks and springs are one of the few parts I have left on my '01 parts car. I'll probably put them on soon and upgrade later next year. I'm putting a shopping list together including left and right radiator shrouds and a few other things. I'll text you by Friday. Also looking over your rear bumper and manual top as upcoming projects. Last edited by 78F350; 10-30-2016 at 10:31 AM. Well, an honest testimonial for getting a PPI! 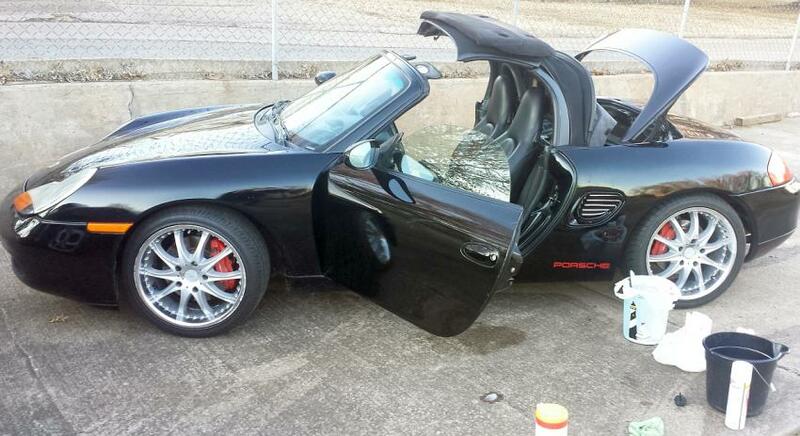 Nothing riskier than a super cheap Boxster. 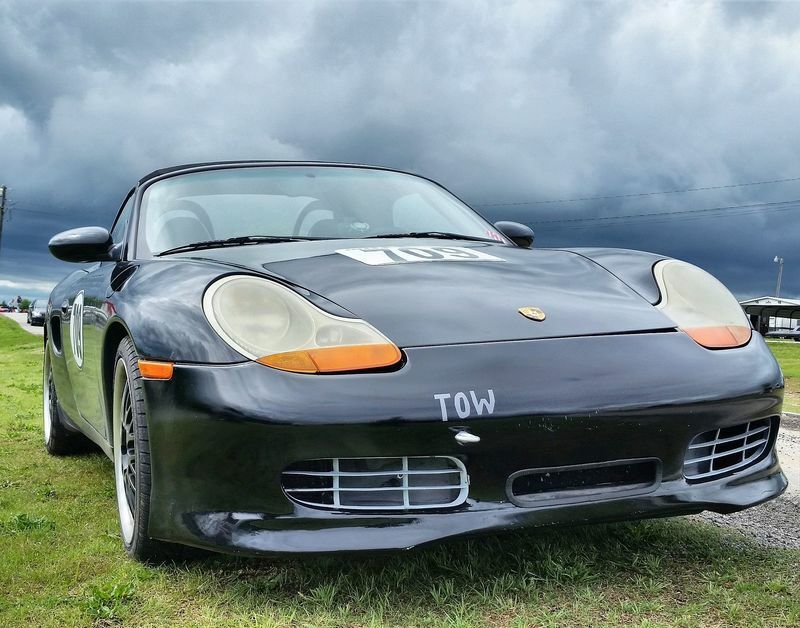 I learned my lesson the hard way when I bought the black Boxster roller that is now my race car. 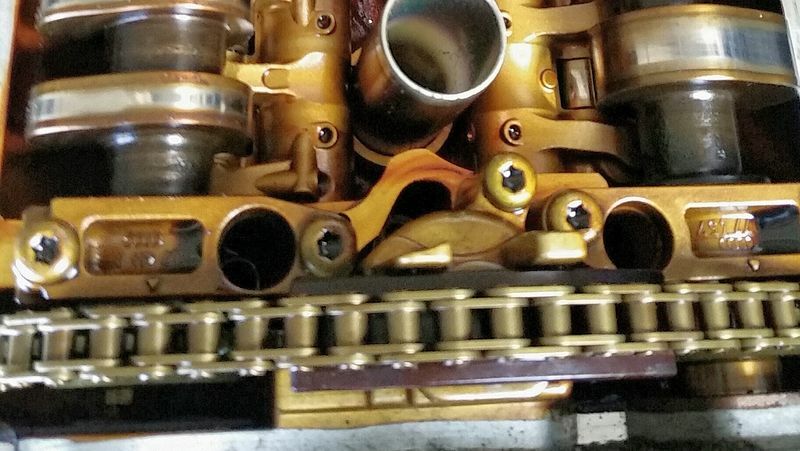 Seller swore that the only thing wrong was a failed engine. Only later did I find all of the other things that he neglected to mention. Wishing you the best and let us know if there is anything that we can do to help as you move forward on this car - once its basically sorted, it should be an excellent track/DE car! Oh crap. I just spent well over $1000 on a 'dropout' 1999 Audi V8 (complete harness, accessories, and ECU) and flywheel adapter from 034 motorsports. 1) Don't tell my wife. I still have about a week to make up a story before it all arrives. 2) I still don't know exactly how I'm going to do the engine swap. No way I can do anything like what kcpaz did. There's a few variations in different forums and most of them seem to fade out before completion. This is not going to be like the Lego Block simple swaps I did in Hondas. 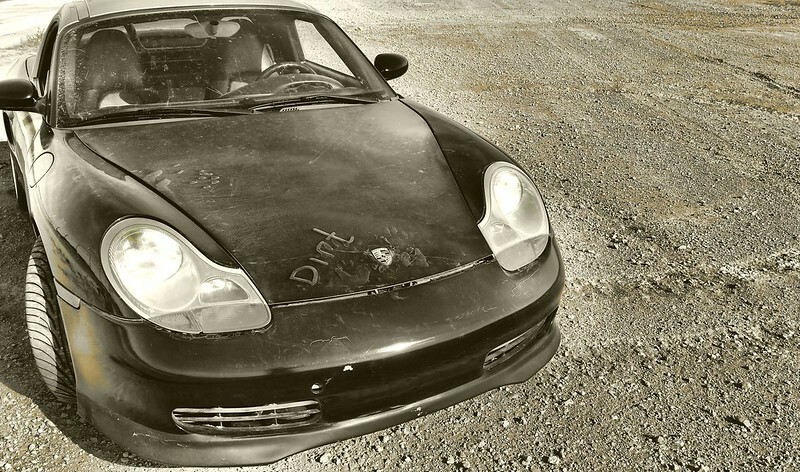 3) At least I still have a spare back half of a Boxster to develop it in while my car remains driveable. So, don't expect a lot of quick updates on this aspect of my build. I still have a lot of research and planning to do. Feel free to send me plans, schematics, and money. For months I have been watching salvage auctions and Craigslist for a donor car. In my area they have not been available and paying >$700 on top of the purchase price to ship a junk car from 500 miles away didn't make sense. I finally settled on just buying an engine. The ABZ version of the 4.2L seems best for the low cost and relative simplicity - less fabrication/adaptation and greater chance of actually completing the project. I inquired with several vendors and eBay sellers about getting a complete engine/harness/ECU. Youngstown Auto Wrecking in Ohio was very helpful and set me up with exactly what I wanted for a good price. ...if it arrives as described. 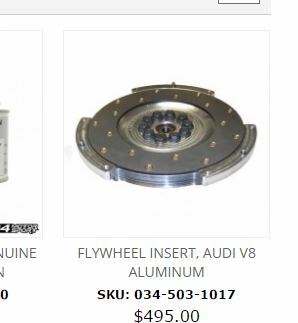 A note on the Flywheel Insert above: The US Audi D2 A8s did not come with a manual transmission version. The ABZ (32 valve) engines have a 10 bolt flex plate and there is no OEM version of a flywheel that I can find. 034 Motorsports created an insert for the flex plate that serves as a flywheel. The next generation of 40 valve engines have an 8 bolt attachment that can directly use the flywheel/clutch options from the 2.7T. This is awesome. I have a Bentley that covers the engine, but I hate the VW/Audi 'Current Flow Diagram' format schmatics. Having this format will make it so much easier to figure out the loom. For the Boxster, I have a complete set of shop manuals and the remains of my parts car with a COMPLETE chassis harness and engine harness to play with. That and some misc Audi and VW parts left over from scrapped cars. I was just going to sneak a little update in as an edit rather than bumping the thread, but it seems that posts of a certain age can no longer be edited. So here is a 'no real progress' update. No changes to the car other than putting an eBay-shipped-from-China resistor in one of the radiator fans. Then I got an 03 Audi A8 with an AUX engine (40 valve 4.2L V8). A blind purchase from a salvage auction. I didn't really want the car, but I had been watching for one for a long time and when the opportunity presented, I couldn't resist putting in a low-ball bid. My bid did not meet the reserve, but the seller made a desperate counter offer. Feeling adventurous, I picked up the car at the salvage lot and drove it 70 miles home. My biggest concern with a D2 A8 was that the transmission would be bad, but it was fine. The car had problems though. Bad tires, one being an odd size from the rest. Failed LCD in the instrument panel. Passenger window went down, then not up. Bottom 1/2 of front bumper missing. Brake pads need to be replaced. It ran out of gas while the gauge was at 1/3 tank. Misfires all on bank 1. For a while I planned to fix the car and keep it as a loaner for friends and family, or flip it. When I did a thoughtful analysis of cost vs benefit, dumping all that money into that car didn't make sense. It is now an engine donor for my project. The ABZ is set aside, maybe for a swap in a '99 later. Analysis of the engine lead me to believe that the cam adjuster for the #1 side had failed or the pads were bad. 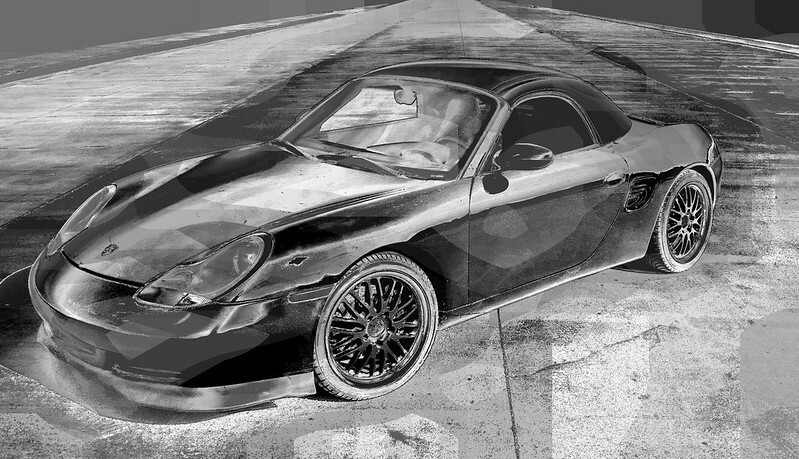 It is almost identical to the VarioCam system in our Boxsters. I bought parts and tools and waited for a not-too-cold day to get to work. Got it all opened up today and found that the timing belt was not set right. Off by about a tooth. Someone had obviously done some work without locking the cams. Markings implied that rather than set and lock TDC, they had picked a random point and hoped that nothing would shift. The valve-train on both sides looks good. The cam adjuster pads are barely worn. 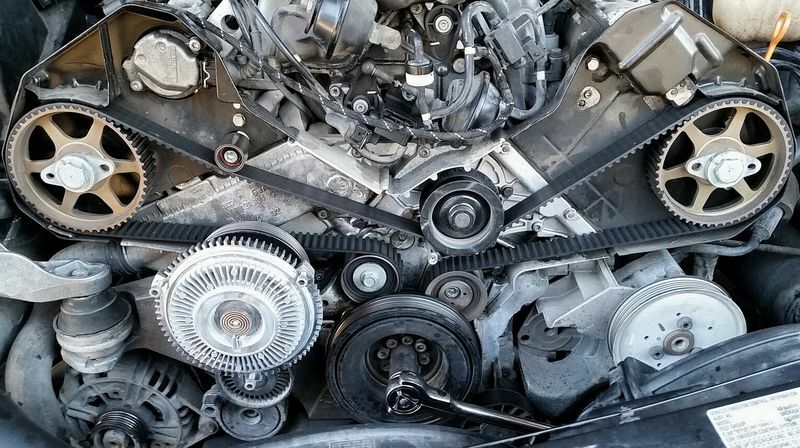 Since I have all that parts and tools, I am going to do the 'while I am in there' stuff of replacing the cam adjuster pads, thermostat, water pump, tensioner, and belt. I'm keeping the car together until I have the engine sorted out and tested, then it all comes apart. It will be good to have the whole donor car here as I figure out the swap. I don't plan to do frequent posts or use this thread as a V8 swap journal. As I go, I will take notes and post any significant updates. Setting TDC: At TDC a tool screws into the case locking the crankshaft. The tabs on the cam gears are aligned with a bar that fits to the holes. They did not quite align. Last edited by 78F350; 01-24-2017 at 05:08 PM. I have my A8 stripped, and sold enough parts to make it a pretty good deal. Now I'm starting to think about actually doing the engine swap. I have little skill or knowledge, but lots of parts and ideas. Right now my idea is that I want to know that I can make this engine run before I bolt it into the car. Once it's in the car, it will be fairly inaccessible. I did complete the maintenance on the engine including the water pump, timing belt, and camshaft adjusters, then put about 100 miles on it before I stripped the car. Last edited by 78F350; 03-23-2017 at 02:43 PM. Reason: can't figure out embedded video link. 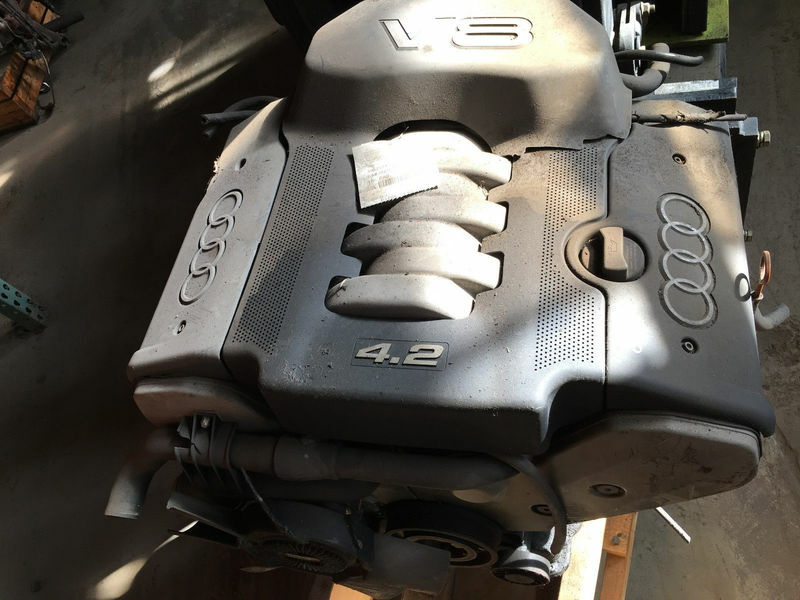 The immobilizer can be deleted from the ECU for the Audi V8. That is pretty simple, and then you don't need to have the cluster. PM if you would like details. Yes, I have a 1998 ABZ engine and a 2003 AUX engine and a flywheel & clutch arrangement for each. Originally I was working with the '98 engine, but now I have both and think that the '03 engine will be a better swap for the 2000 model car. I expect that after I get the swap all worked out in the 2000 (mostly for track), I'll start working the ABZ into one of my 99s as a more 'polished' street car. For me this is a very slow process, but I will make updates. 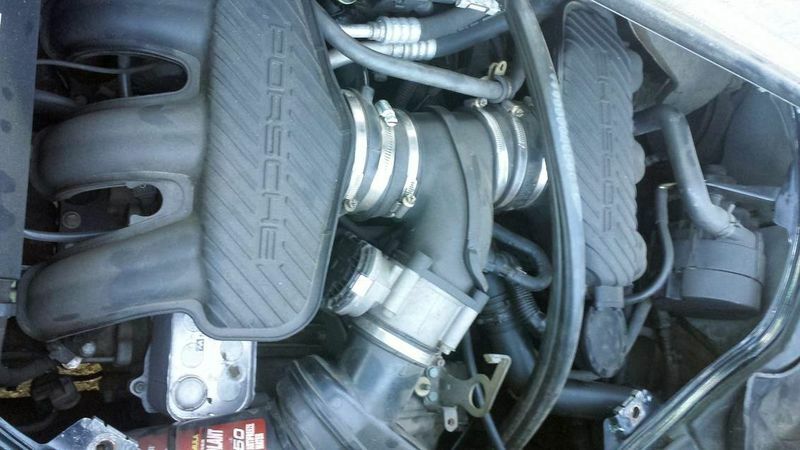 Audizine has a few good 4.2 swap threads, but they are mostly into A4 sedans. I've also watched a Cayman swap on Planet 9. Mine will not be a polished professional job like that, but I'm hoping to make a rough looking, solid performing track car that can be driven on the street. Transmission question: 5 speed into an S? Looking ahead, I plan to install a 5 speed transmission from a 2001 2.7L into this car. Yes, it's not as robust as the 6 speed, but it works and the 01A Audi version has been paired with this motor many times without issue. I haven't researched any of the details of how to make this work yet. Feel free to post any tips, trick, or warnings for me to consider, or preferably a complete DIY with pictures that a 5 year old could follow. I think I have everything from the 2001 available including axles and clutch slave. Everything for the 6 speed is currently in the car and operating correctly. I think that the transmission suspension/mounts for the 5 speed will be a direct install. Have not looked at shift linkage. Issues? I'm guessing the clutch slave just needs to have the hose connected. Axles... Haven't looked yet, but I'm hoping that I can swap the ends from one to another. If that doesn't work, I may look at some Audi parts. I may want an output flange with a heavier coupling than the 5 speed currently has. Will the flanges from the 6 speed install in the 5 speed? The engine thing? ...maybe later. Priorities change. In early April, I had most of the Audi engine harness connections identified and connected to various things. I powered it up and got the instrument panel/immobilizer good, it had good fuel pressure, cranked but didn't start. No bounce of the tach needle. I needed my garage for other things, so all that mess got pushed aside. Here's the thing. I want more power. Accelerating hard from the low rpms, up through the band is a good feeling. When you are on a track with powerful cars all around, or you have it floored exiting a corner and the instructor says, "Ok, give it some gas now." the 2.5L falls a bit short. The reality is though that I am not skilled on the track yet. That extra torque will get me into trouble quicker, but not necessarily around the track faster. I will get the engine swap done, but what I need for now is to make the basic car safe and reliable as I develop my skills. 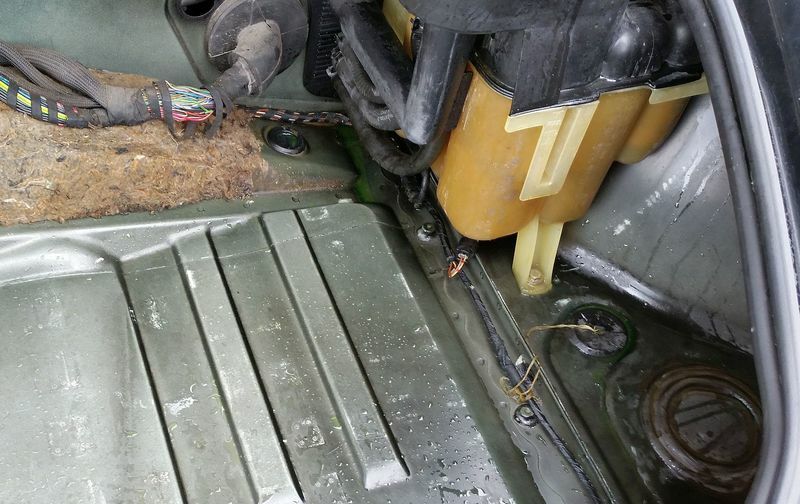 Over the last couple weeks I replaced the leaking steering rack, stripped out weight, put in a Sparco seat (then put the original seats back in), changed fluids, and thought I fixed the cooling system - which had been running hot and venting coolant. Today I took it to the track. In hindsight I realized that this was the first time I had driven the car over 20 miles. I probably should have given it more of a workout before driving 90 miles to the track. I managed to get two sessions in. The car felt good and handled great, but during the second, it started overheating. I decided to call it a day and focus on just getting the car home. From what I can tell, it has a leak in the expansion tank that only leaks under full pressure. The tank has looked rough since I got the car, but I was hoping to get by until I swapped the engine. With the vent open on the coolant tank, it didn't seem to have much trouble. I made the trip home only stopping once to top off the coolant. Next DE is in two weeks. I'm hoping to have it ready again by then. Last edited by 78F350; 04-23-2017 at 08:58 PM. You've probably done this but check the coolant cap. Mine failed at Pocono last year. As soon as I turned the motor off at the end of a session it would blow water.